Alex Clark is a master modeller. If you've ever seen his web site, you will know what I mean. He's also the moderator of Missing Linx's Braille Scale discussion group. So who better to write a book on 1/72 scale Armour Modelling than him? Starting with an introduction explaining why he chose 1/72 scale and why the Panzer IV, he then goes on to describe the tools and products he uses. 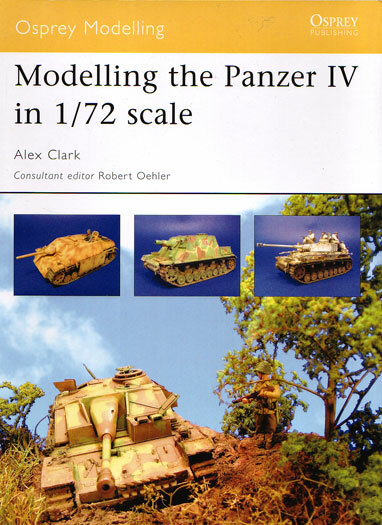 Each one of the panzer IV based models he has built has a section describing in detail a process he used in that particular build, even though he may have used it in some of the others, it's only described in detail in this chapter and each chapter has it's own special section. For instance, in the Panzer IV Ausf H, it's winter camouflage, with the Jagdpanzer IV, it's how to apply Zimmerit and so forth with sections on Mottled Camouflage, Resin Casting, Masking for Hard Edged Camo and Scratch Building. The five models built especially for this book, Panzer IV Ausf H, Jagdpanzer IV, Sturmpanzer IV, Sturmgeschutz IV and Flakpanzer IV Wirbelwind are all based on the excellent Revell Panzer IV Ausf H or J combined with other kits, resin or PE after market accessories or scratch building to produce five highly detailed and accurate models described fully in both text and colour photos with captions. One, the Stug IV, is placed in a small vignette with trees and bushes plus one figure and this is also described in full. The next chapter is a Gallery of three Panzer IV based models that Alex had built previously and fetured in magazine articles, the referance for these is within the text on each vehicle. This is followed by a page each of References and websites and Museums and collections then seven pages of Kits and accessories which includes six Table lists. To round things off, Alex has included a page of colour swatches of the eight main camouflage colours he has used with a description of each on the back including mixes. These are all Humbrol paints and he gives full names and numbers. Although I could never hope to meet the standard Alex's models, he has given me quite a few ideas to try and that is, after all, what this book is all about.